In the last years the advancements in software engineering have lead to an increasing automation of aspects such as testing, deployment, management of new releases, and, at the same time, have allowed researchers and practitioners to identify new approaches for creating and operating software and services (think of DevOps as an example). However, we cannot stop researching. The increased maturity of software engineering goes along with an increasing variety of societal and business needs, which, in turn, determines an increasing complexity and peculiarity of services and applications. This has lead to the development of fields like IoT, Big Data, Cyber-physical systems and to the introduction of new complex technologies (e.g., Spark, Storm) and even new “software-defined” paradigms for infrastructural resources. All these help addressing several problems but require specific expertise and skills. In this context, the mission of software engineering is to offer the right tools and methods to guide users in all activities connected to the lifecycle of applications and services, through the usage of technologies and new paradigms, still ensuring productivity of processes and quality of software (performance, availability, evolvability, reliability, …). identify effective go-to-market strategies for the outcomes of research projects. Cluster contribution to the definition of the challenges for the next research work programme. If you are a partner in a European project focusing on software engineering aspects, please participate in our survey https://goo.gl/forms/7QVWkofCO3Vijaro2. We will share the results with all survey participants. Join us in the Networking Session held from 10.00 to 10.45 in room M1. Here are the slides shown during session. ICT 2018. Check the videos of some projects from the cluster participating in the event. Concertation meeting 2017: Within the context of this conference we have had a cluster meeting on June 28th from 15.30 to 17.00. Requirement Engineering Conference (RE’17): Possible panel about H2020 projects. International conference on integrated Formal Metods (IFM2017): The Hyvar project is organizing a workshop there and would welcome the participation of other projects. 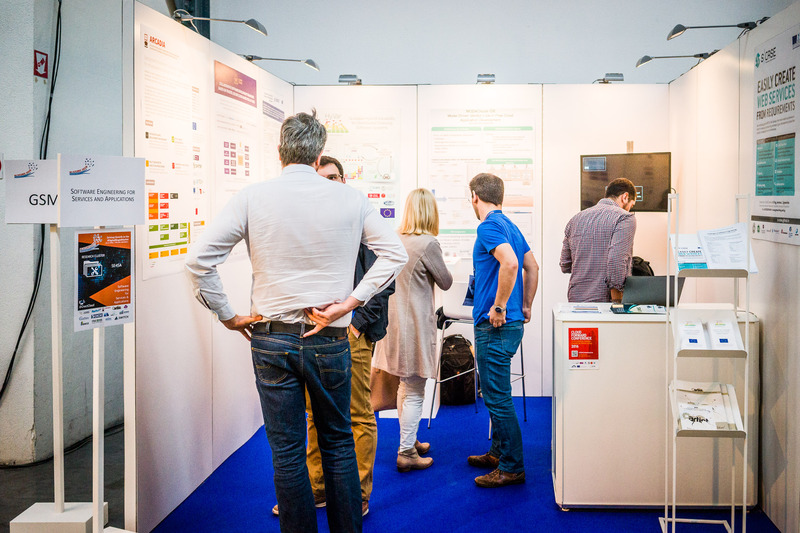 Cloud Expo Europe 2015, Frankfurt 10 and 11 November 2015. The participation to this event is sponsored by the projects CloudTeams, CloudWave, SeaClouds, SWITCH, S_CASE. Expert Workshop: Challenges & Opportunities for the European Software Industry, October 6 2016. Here you find the slides presented by our cluster representative, Sotiris Koussouris. 29 Nov 2016, SWITCH co-organised 2nd IT4RIs workshop in the context of IEEE RTSS. The topic is about nearly real-time processing and time critical cloud applications.